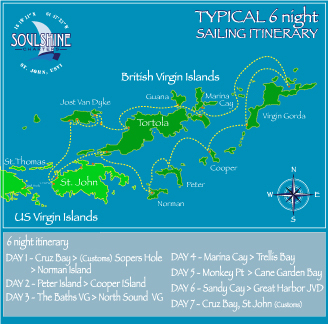 7 nights aboard Soulshine allows you to hit all the stops as we make our way around the Virgin Islands. This extended cruise takes us all the way out to Anegada, a remote barrier reef Island 16nm NE of Virgin Gorda. During the winter months we may even be lucky enough to spot some migrating whales! A full week on the water really allows you ample time to explore all the natural wonders and community interaction the Islands have to offer. All itineraries are flexible and can be re-charted anytime during your vacation, weather and time permitting. If you're looking to maximize your sailing, this is the perfect itinerary. Tacking upwind through the Drake channel you'll be able to stop at all the beautifully secluded Islands such as Norman, Peter, and Cooper as we make our way towards Virgin Gorda. From there you'll enjoy a couple of days of downwind sailing as we approach the North side of Tortola and visit the world famous Jost Van Dyke. This itinerary is perfectly suited for the adventurous traveler who's looking to get the full Virgin Island experience. All itineraries are flexible and can be re-charted anytime during your vacation, weather and time permitting. This is a great way to hit most of the popular spots around the BVI's. After a relaxing first night tucked in St. Johns North shore, we'll make our way over to the BVI's where you'll have a plenty of destinations and activities to choose from. Enjoy the local ambience of a beachside restaurant, or anchor out in a secluded bay while watching the stars paint the evening sky. All itineraries are flexible and can be re-charted anytime during your vacation, weather and time permitting.